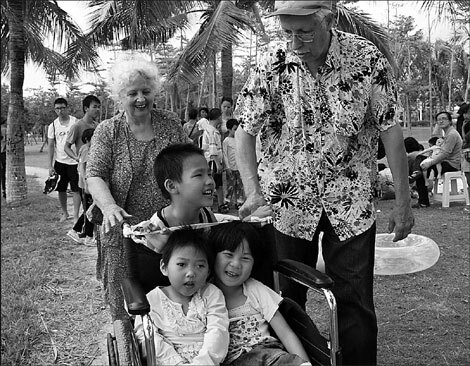 An elderly US couple touches many hearts by taking in a growing litter of children with mental disabilities in Hainan province. Raymond Zhou and Huang Yiming report in Hainan. In 1993, John and Maggie Davis were working in Qionghai, Hainan province, when they got a call from a local doctor. They were asked if they wanted to take a look at a baby girl who had been abandoned on the campus of the local college where they taught. The 8-month-old turned out to have many problems. She had cerebral palsy, scoliosis and autism, but Maggie could not let go. She made frequent visits to the hospital. "Her parents wanted her to live," Maggie reasons. "She was wrapped in a clean blanket and left in a place where many would pass by." In 2002, after living with them for almost a decade, Qiongjian was legally adopted by the Davises. "Officials from the provincial office of the Ministry of Civil Affairs came to assist us in the adoption procedure," Maggie says. In a way, the daughter’s name tells much of the story: "Qiong" is short for Hainan, but "jian" poses a special problem. In Chinese, there are two words for "jian" that are so close in meaning they are often misused. "It is not jian as in ‘pick up’, but jian as in ‘select’," Maggie, who speaks fluent Chinese, emphasizes. "We selected her. God gave her to us as a special gift." Qiongjian is now 18 and noticeably small for her age. She has not uttered a word, nor can she walk upright – and that’s after multiple operations, one of which inserted a rod in her back to correct the curvature of her spine. The Davises hired two full-time caretakers to tend to her daily needs. Maggie would hold her in her arms and talk to her. "But she has never called me Mom, yet," Maggie says, with a smile and a glint of tears in her eyes. But Qiongjian, in a subliminal way, started something the couple never intended: After bringing Qiongjian home, the Davises began noticing more children with special needs. In 2004, they set up The Bright Connection, a care center for kids like Qiongjian, who suffer from autism, cerebral palsy or similar disabilities. The center, located at a foothill residential area typical of the densely populated "urban villages" in southern China, occupies a new five-story building with some 1,600 sqm of indoor space. One floor is for children with autism, and another is for those with cerebral palsy. The front yard has rows of low tables where the kids are spoon-fed. Every child, every room and every bed is tidy and clean. On the roof, two middle-aged women work with piles of laundry. Two dozen staff works two shifts to not only feed and shower the brood but also provide physical therapy tailored for every individual’s condition. The center now cares for 32 children. Slightly more than half are sent by parents, while the rest come from government-run orphanages. "We’re constantly taking in new ones, and we have moved several times in the past seven years to accommodate them," Maggie says. Contrary to what one may surmise, the Davises aren’t superrich. Before they came to China, John, now 66, drove a school bus. Maggie, 69, was a schoolteacher. They worked in hotel consulting and taught English during their early years in Hainan. Now, they work full time at the center and don’t get a salary. Maggie credits the kindness of strangers for keeping the center running. For a while, John was paying with his own credit card, but then "a kind lady from Australia paid off our debt". Initially, more donations came from overseas than from locally, but the situation has reversed, Maggie says. "Chinese hearts are always moved to help us," she says. In early March, Maggie had exactly 35,882 yuan ($5,693.33) in the center’s bank account. But she’s not worried. Anyone else would have been. Her monthly expenses can reach 80,000 yuan, but she gets half of that in contributions. Parents chip 500 to 1,400 yuan a month, depending on their financial ability, adding up to a total of 19,000 yuan. The government gives 500 for every orphan, which totals 14,000 yuan. The government also covers medical insurance. Additional sources of income include 5,000 yuan a month from a Shanghai church and 2,000 from a local businessman. The shortfall is made up by random donations. "Where there is a true need, the money will be there," Maggie says, optimistically. "God does not fly over and drop a bag of money. But He talks to people and moves their hearts." To illustrate her point, she told of a time when funds were running dangerously low until Cathay Pacific Airlines called out of the blue and donated $64,000. "We used the sum for three years," she says. The Davises have lived in Hainan for 19 years and have witnessed the dramatic rise of the island into a tourist mecca. However, their careers in a booming business were sidetracked by their devotion to charity. Now, their altruism moves many in the tourism industry. Some luxury hotels in Sanya occasionally offer goods or money to the center. One provides all the beans it needs. Someone else picked up the bill of 100,000 yuan for the renovation of the new facility. Still another man let them use his vehicle for free. Recently, 15 Hong Kong high school students took the kids to the beach. "For this, we need one adult to take charge of one kid," says the center’s manager Yin Taohua, who was with the Davises even before the center opened. It was the third time students from the Hong Kong school have visited and spent time with the kids, Mike Kersten says. "Their hearts are touched by the love they see here," he says. "They realize how fortunate and blessed they themselves are." College students from Hainan also volunteer at the center, and official philanthropic organizations visit on special days, such as Chinese New Year or Children’s Day. The Davises’ vision is to have a center with 100 kids. Maggie dreams of "a rich Chinese" who has made tons of money from the property boom and decides to build such a facility, "so that we have a place of our own and do not need to move again". But what about the cost of maintaining such a large operation? And who will take over when the Davises are gone? "Somehow, someway, these things will be provided for," Maggie says. "Over the years, we’ve never begged for money." And what about Qiongjian, who spent most of her time at the center before the Davises moved to a separate apartment a year ago? Maggie says her son, who is now 31 and married, will care for his little sister. "He lived with Qiongjian for a year, and both he and his wife love her very much," Maggie says. "My faith has grown bigger and bigger." That faith, which has given rise to all the love for the unfortunate children, lies not only in the greater good of humanity but also in something bigger.